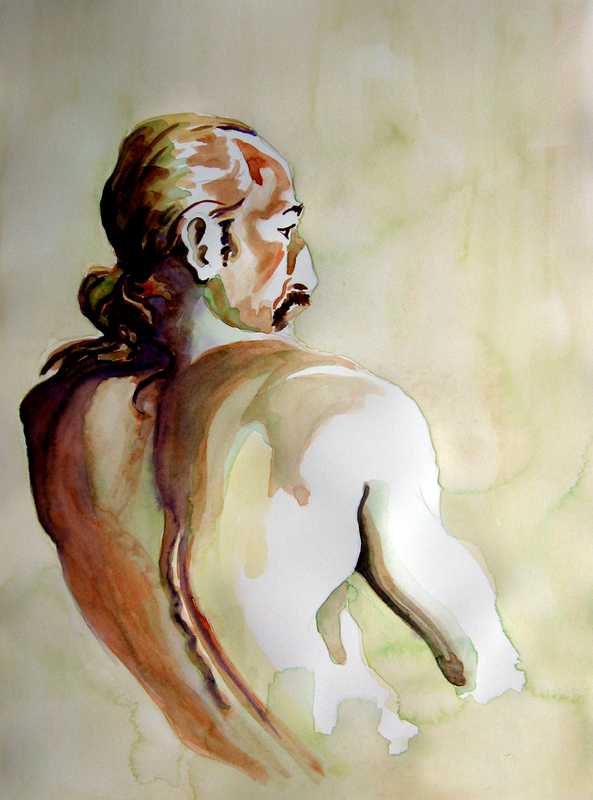 This is one of the few paintings I have done on Arches 140lb hot pressed paper. I wanted to contrast the wet-in-wet blurry look of the background and try to bring out the detail of the bird. I find this paper allows each brush stroke to show and once the color is applied it stays. I haven’t worked with it nearly enough, as yet, to get a real “feel” for it, and want to devote some time to this challenge in the future. I was intrigued by a project that Beth Parker talked about called a whiskey print. She said you could take an ink jet print and place it face down on your paper and liberally brush whiskey on the backside and the print would come off on your paper. Above is my whiskey print and the resulting painting. 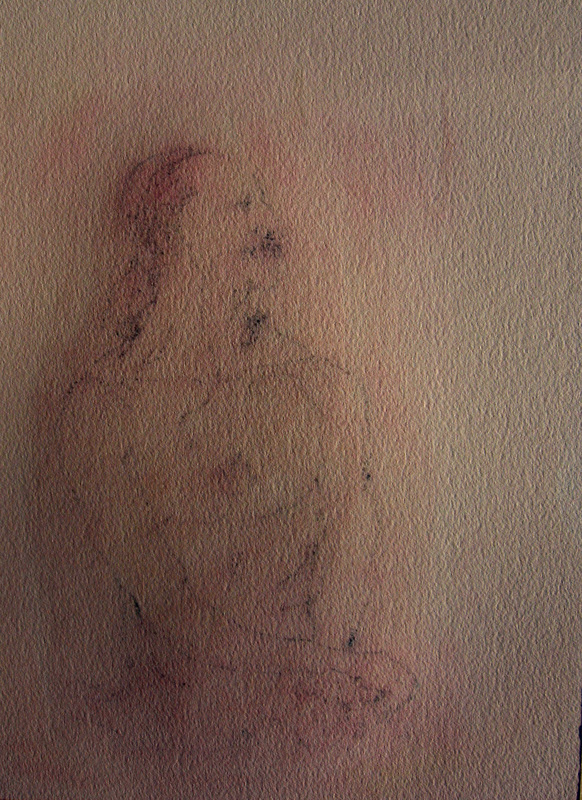 I used one of my figure drawings and transferred it. This can also be done with a photograph. I will be trying more of these as I don’t drink whiskey and it didn’t take the whole bottle for this print. 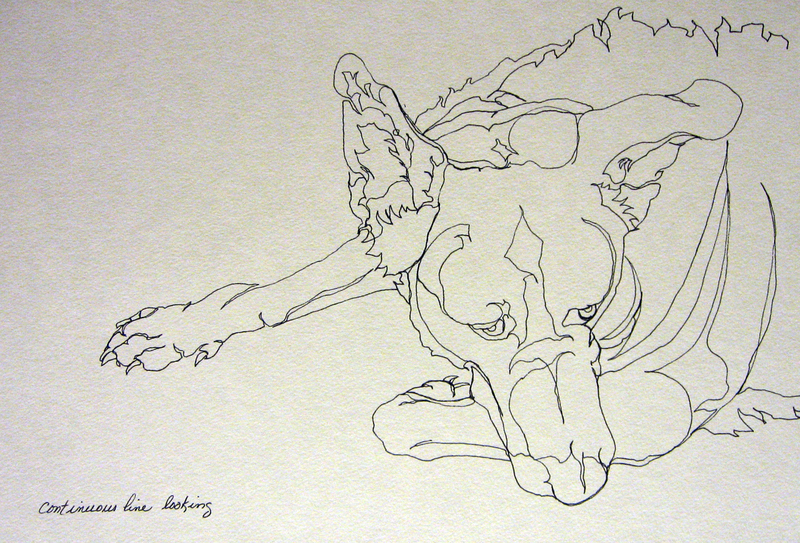 Tonight was the first night of drawing class and we practiced blind continuous line as well as continuous line drawing. I went on to explain if you continued on with describing the form in cross contour that you could end up with a likeness of the object being rendered. Where an object is rounded, your drawing implement has to caress that form and emulate roundness, where it is flat the medium has to flat line it. All an object really is is a whole lot of contour lines sitting next to one another. This is called modeling in the form of an object. I happened to check out Antsketch’s drawing for today and he had done the same technique with figure drawing. Two different takes on the same technique. I promised to have some sort of cityscape going when I posted “Walking the Dogs”. This is my second attempt at a cityscape. I took this picture out the front window of my sister’s car on a Sunday morning in June. Lakeshore Drive brings memories of heading home to Wilmette with my Granny. She could navigate this road, beautifully. I need work on city scapes. Mine tend to look stiff. Probably because I’m using the think side of my brain instead of the feeling side. I’m going to take my own suggestion and do some blind line of cityscapes and continuous line to try to get the feel and the flow of one. Thank-you to Stephen for continually whipping off those landscapes and sharing your experiences. Reading your posts have inspired me to work on landscapes more. 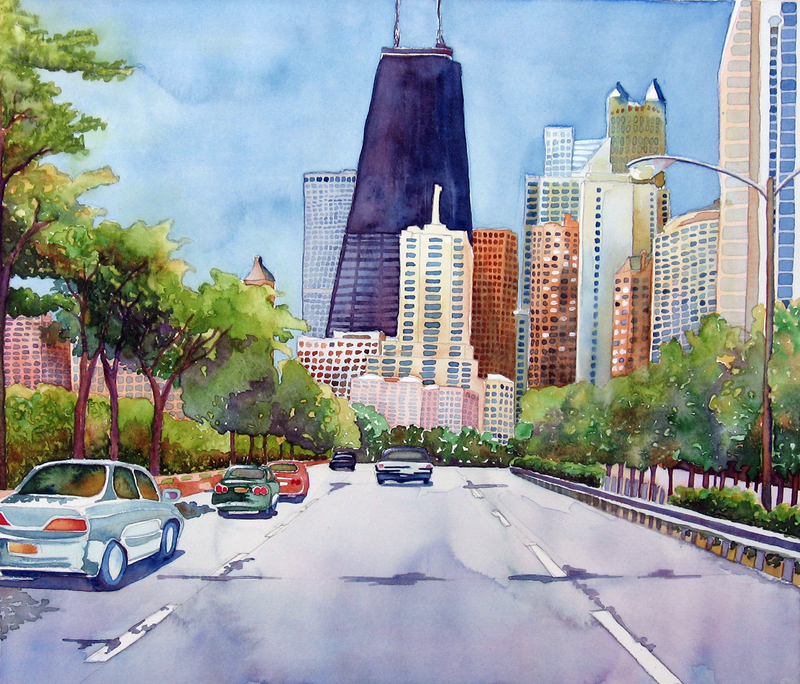 Thank-you to Raji who accepted the challenge of a cityscape, recently. Seeing his post got me back on track. 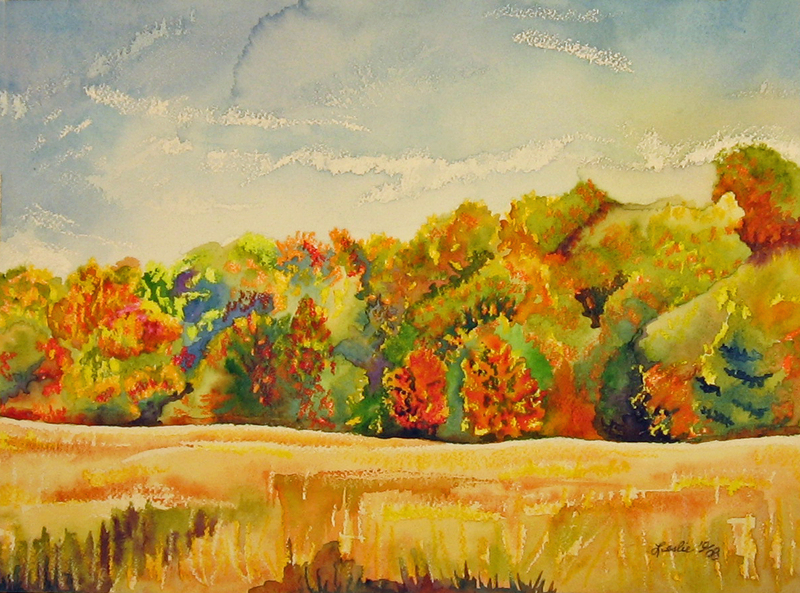 This landscape painting was created using wax resist. The white clouds in the sky and the field are crayon as well as some of the colors in the trees. The wax in the crayons resist the watercolor allowing them to show through. I have created several interesting paintings with this technique. You can also use candles to create effects on your paper.The candles can be rubbed in over dry watercolor before a second layer is applied. The first layer will show through wherever the candle wax was scrubbed in. When using crayon colors other than white, make sure they are compliments or a different value than the watercolor or the resulting effect is rather dull. 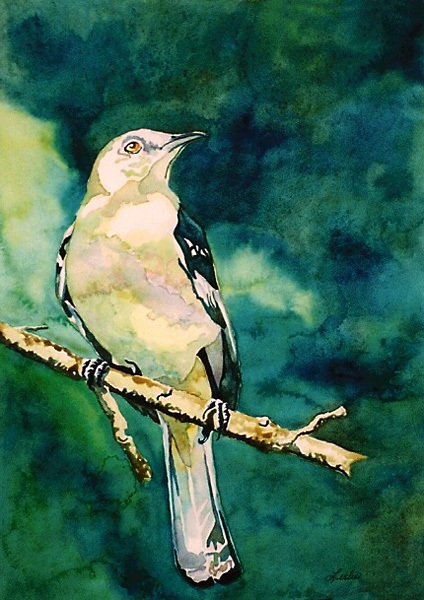 This is an excellent technique that can add texture to a watercolor when cold press and rough watercolor papers are used because the wax rides on the bumpy surface and allows the watercolor to settle in the grooves of the paper. June did a wax resist on one of her chili pepper studies a while back. Carol tried wax resist in her new painting, today! Does anyone know what kind of bird this is? My daughter snapped a picture of him or her at the Lowry Park Zoo this spring. He is about knee-high to an adult and she begged me to paint him because he followed her around and cocked his head like this to look up at her. He has a feather on the top of his head that bob’s as he walks and he is gray to grayish brown in color. I googled lowry park animal photos and found him on one photographer’s site, but he didn’t have a name next to him; just a photo# and I didn’t pursue it. I really pushed the cartiera magnani paper this time to see what would happen if I scumbled in a background and built up some layers. I lost that glow of transparency I had with the flamingo #15 and the meerkat, but am not at all displeased with how the paper responded to the scumbling and layering. Thank-you to LittleLynx. She knew that this bird is a red-legged seriema! I believe it was my first watercolor class when the instructor told us to paint a painting that read mostly secondary triad. I asked him what the secondary triad was. If I’d learned it earlier, I had forgotten. This opened a new door for me. He told me to go home and look through some art books and research it a little. I found a world! of information on color combinations. I had so much fun playing around with color combos and used them to create all sorts of subject material. Here are two that I painted. The first one was painted using colors red, yellow, and blue, which is known as the primary triad. The second one is painted using orange, purple and green, which is known as the secondary triad. I sometimes set challenges for myself, like an analagous painting (group of colors that sit next to each other on the color wheel), a monochromatic painting(shades of the same color) and complementary painting (opposing colors on the color wheel). I often look for these combinations when I view other artists’ work. Knowing a little about how to combine my colors has helped to make my paintings be more harmonious. Daisy is a friend of mine’s German Shepherd. I have been wanting to draw or paint her for awhile, now, so I did both. I have explained that I sometimes do both blind and looking continuous line drawings because they help me study the contours better. I took the time to do that with this project so you could see several different approaches. 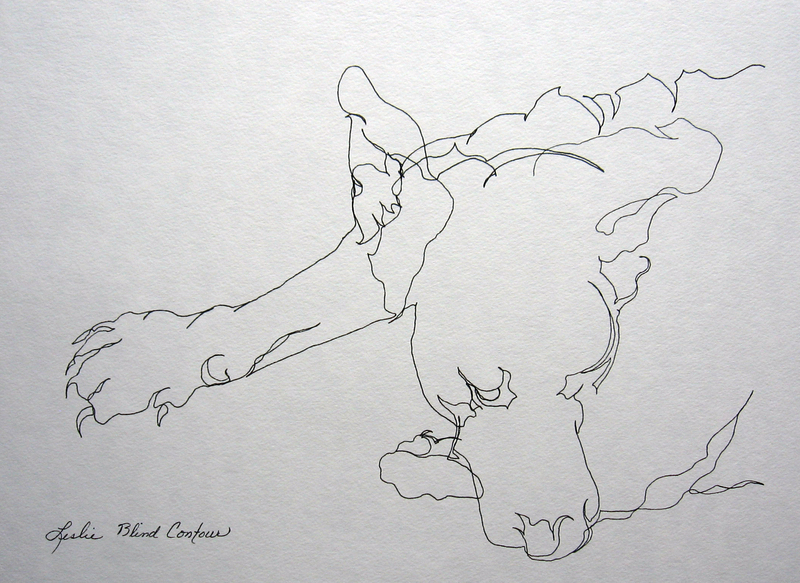 I attempt to include more when I look at my paper using continuous line. If I get tangled up in an area, I try to find a new contour to track back along. Remember to pretend you are feeling the object . Daisy is not flat like the side of a building so the strokes across her body will appear to be rounded if I felt her contours correctly. Here I tried a new paper, Stonehenge 250GSM. I’ve finally found a paper that I like for colored pencil. It takes many layers that lay on smooth and doesn’t leave those little white bumps. I found it on Dissengallery Blog blogroll’s art supply link. I have been searching for a more free way to use my colored pencils than what I’ve been doing. I started this drawing with gesture to create the form. Over the top of the gesture I drew the lines that I had practiced in the previous drawings. As the drawing began to take shape, I changed colors to correspond with my photo reference and started layering them in loosely. 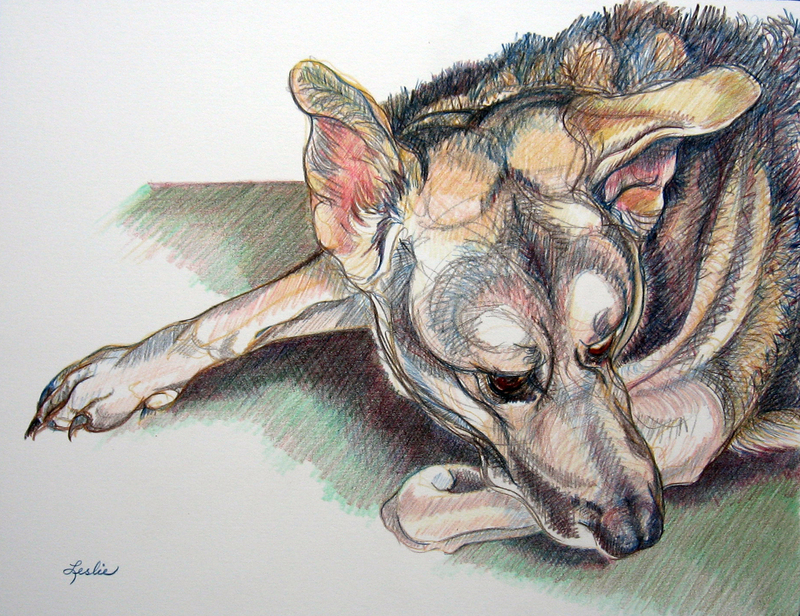 This was a much more pleasing approach to colored pencil than what I have been doing . I’ll try some more of these and see where it takes me. 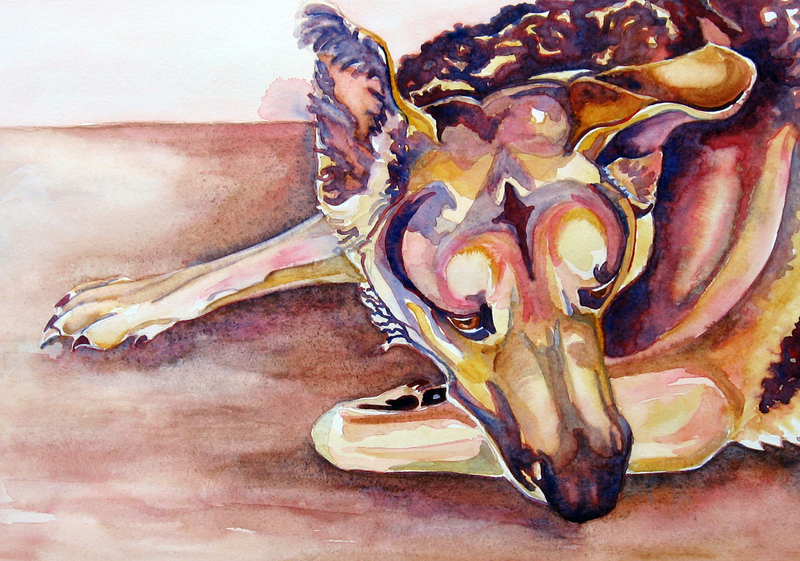 I then challenged myself to create a watercolor of her using only the primary colors (red,yellow,blue). The above was the finished result. I used Lanaquerelle cold pressed 140lb watercolor paper. I like this paper for the soft wet look I seem to get with it. The following blogs have tried a blind line and posted it! In a recent post, I stated that I had drawn an image using continuous line. I often study objects from life using a continuous line and, many times, draw the object blind, first. 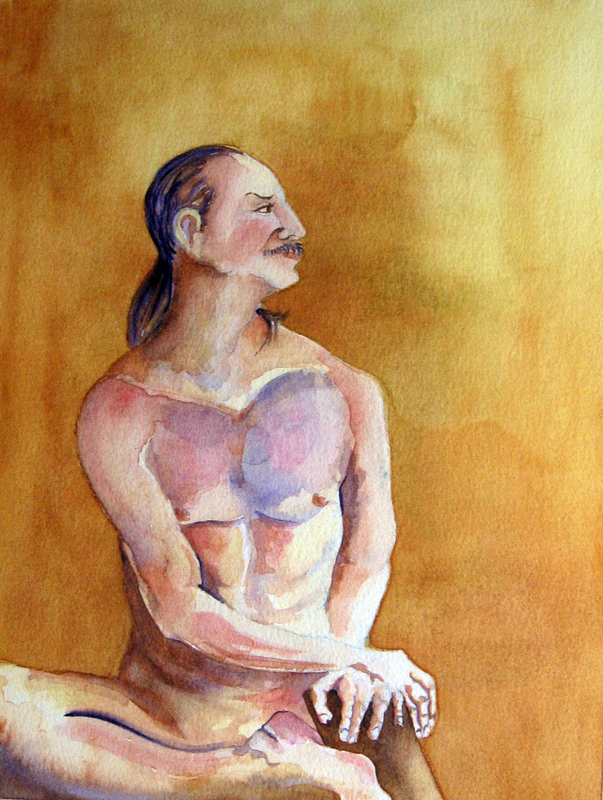 The above drawing was done from life in my figure drawing class a year ago spring. It took 4 minutes tops to draw. What the artist does is places his pencil or pen at a starting point on the paper and imagines that he is touching the contours of the object he is rendering. He is like a blind person feeling the contours of an object with his hands. This includes the contours along the outside edges and the cross contours that run across the object. In this case, the object is a figure. I began this drawing at the point on the head where you see a line ending in space and finished it where you see another line ending halfway up the right side of the paper. You can see hands, arms, hair, feet, folds in the clothing and the general pose of the model. Blind line is almost always distorted, but rich with information that our left brain wants to convince us we don’t need to include. If our analytical brain had it’s way, a head would always be an oval and our arms and legs would look like everybody else’s arms and legs and on and on. I tell my students that this type of drawing is invaluable as a warm-up exercise before setting to work on a drawing. It is also an excellent lead-up skill to gesturing an object because it teaches the artist to keep his pencil on the paper and flow with the form. It is surprising, if practiced daily, how quickly students improve in their drawing skills. It’s similar to pianists learning to feel their way around the keys of a piano. Many times, my students are disturbed by the distortion in their images and don’t look for the actual bend and flow of the object they have created. 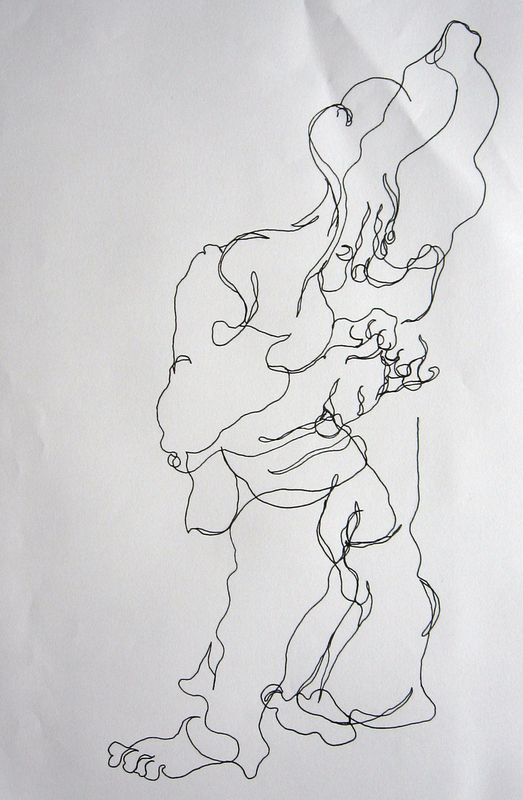 Blind line is not meant to be a perfectly proportioned drawing, but as the artist begins to look at the paper as he makes a study in continuous line, the drawing begins to gain in proportion. 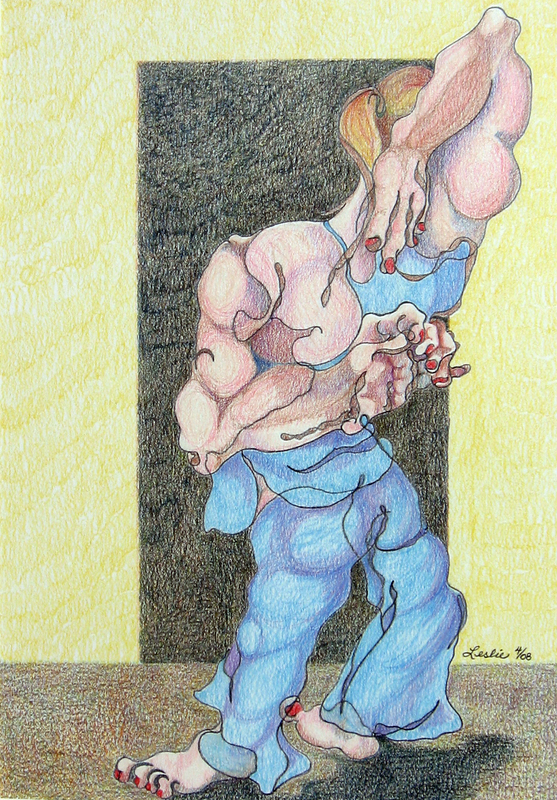 I find that my drawing enlarges in those areas where I slow down on difficult areas. In this drawing, it is evident in the hands. If you look carefully at some classic artists’ works, you may be able to identify with this type of distortion. Perhaps, they too, worked blind from time to time. I took this drawing one step furthur for my students and traced this blind drawing off on to a piece of bristol vellum and colored penciled a finished composition out of it. I wanted them to understand that art can be created in many ways and that our creations are but steps on a journey to seeing. The resulting composition is below. This post has generated some interest of fellow bloggers wanting to try some line drawings. If you would like to view more drawings that have this feel rendered by other artists, two that I follow are drawing diary and antsketch. so you and I can SEE. 47whitebuffalo has a haiku on her sight and is asking you to visit and leave one of yours. It was pretty fun. I googled haiku and read what it was and submitted mine that you see above. 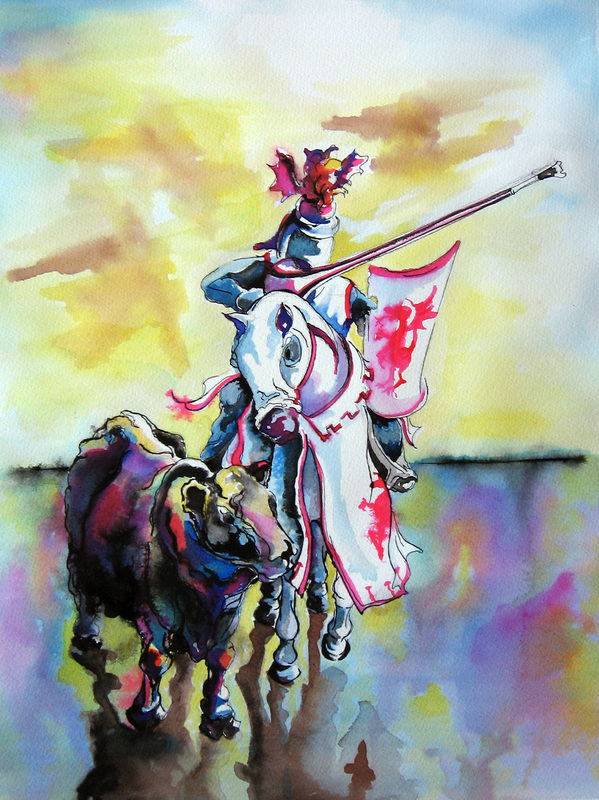 I like to think that the knight has interceded and saved the bull from the matador. 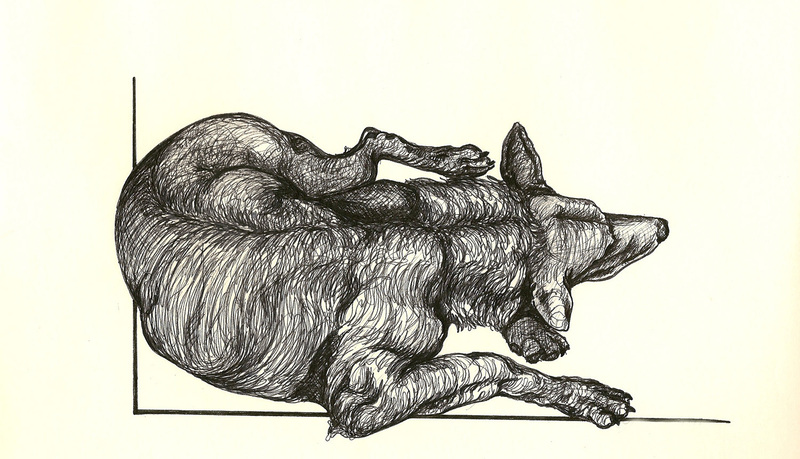 The piece was rendered in ink on 140lb coldpress Arches.